Предлагаем к чтению аннотацию, описание, краткое содержание или предисловие (зависит от того, что написал сам автор книги «Sleeping in the Ground»). Если вы не нашли необходимую информацию о книге — напишите в комментариях, мы постараемся отыскать её. 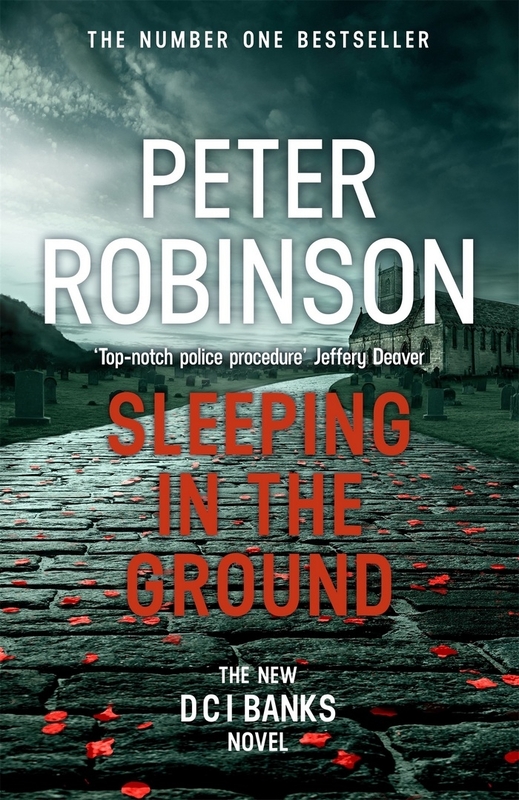 A shocking mass murder occurs at a wedding in a small Dales church and a huge manhunt follows. Eventually, the shooter is run to ground and things take their inevitable course. But Banks is plagued with doubts as to exactly what happened outside the church that day, and why. Struggling with the death of his first serious girlfriend and the return of profiler Jenny Fuller into his life, Banks feels the need to dig deeper into the murders, and as he does so, he uncovers forensic and psychological puzzles that lead him to the past secrets that might just provide the answers he is looking for. When the surprising truth becomes clear, it is almost too late. Кто написал Sleeping in the Ground? Узнайте фамилию, как зовут автора книги и список всех его произведений по сериям. Ниже представлен текст книги, разбитый по страницам. Система автоматического сохранения места последней прочитанной страницы, позволяет с удобством читать онлайн бесплатно книгу «Sleeping in the Ground», без необходимости каждый раз заново искать на чём Вы остановились. Не бойтесь закрыть страницу, как только Вы зайдёте на неё снова — увидите то же место, на котором закончили чтение. If the incident had been a scene in a film, it would have looked beautiful. The violence would have taken place in elegantly choreographed silence and slow motion. Perhaps it would have started with the wedding party milling around outside the picturesque country church, then the camera would zoom in on a rose of blood blossoming from the bride’s white gown as she looks up, surprised, and floats serenely to the ground, arms reaching out, grasping for something too insubstantial to hold. She would toss her bouquet high in the air, pink and purple flowers against a backdrop of blue sky, and it would fall into the arms of a pretty bridesmaid. Then the bridesmaid’s head would disintegrate. Strings of blood would snake through the air like drops of ink in water. But the way Terry Gilchrist saw it — and he was there — it was as swift as it was brutal. A crack, loud enough to be heard above the church bells, was followed by a dull thud, then a patch of blood spread over the bride’s chest. Her body arched, and she spun half around and crumpled in an untidy heap of blood-soaked white chiffon and lace, her mouth open, the scream for ever stuck in her throat. Another crack, and her groom fell beside her. A frightened child clung tightly to his mother’s legs. The bridesmaids clutched their posies, eyes wide with horror. A third bullet hit the maid of honour before she could run for cover. She fell beside the bride and groom, half her face shot away. The men in their grey pinstripe suits and the women in difficult shoes and wide-brimmed hats bumped into one another as they ran around in panic and confusion. A bullet chipped the corner off an ancient tombstone and a sliver of stone entered the photographer’s eye. A guest fell, clutching his thigh. The quickest to react reached the church door as another bullet slammed into the centuries-old wood. Someone managed to pull the heavy door open, and those who could rushed inside. They jammed the doorway, and another bridesmaid arched backwards and dropped to the ground, blood oozing from her back. People trampled over her body in an attempt to get into the sanctuary of the church. It was all finished in less than a minute. Terry Gilchrist reacted as quickly as he could. He was no stranger to sudden death and violence. He had been under fire before, but nothing had quite prepared him for this. Even so, his soldier’s instinct kicked in. He glanced up at the hill where he thought the shots were coming from and saw a dark figure scurrying away, over the grassy summit and down the slope. Gambling that the assault was over and that there was no one else up there, Terry tried to shepherd the stunned and dazed stragglers into the safety of the church, desperately searching for Winsome. There were no more shots. The church bells stopped ringing. Tentatively, one by one, the birds started singing again. Terry stood alone in the bright December sunlight and called the police and ambulance on his mobile. One of the fallen guests was moaning with pain. Nearby, a bridesmaid sat propped up against a gravestone crying, her hands pressed to her bloody midriff where something wet and shiny rested in her lap. Terry was no medic, but he had picked up some basic first-aid training in the military, and he visited all the fallen to see if there was anyone he could help before the ambulances arrived. The groom was his mate, Ben, and he had been shot just above his stomach, around the location of his liver. He was still alive, though barely conscious, and the best Terry could do was tear off and wad up part of Ben’s bloodstained shirt and have him press it against the wound. Tears came to his eyes as he passed the dead bride and cast a glance down at her crumpled body. He knelt to touch her still-warm cheek and closed her staring eyes. It seemed that all he could see were bodies strewn around the graveyard. Then he turned and went into the church to find Winsome. Banks left the crematorium ahead of the others, David Bowie’s ‘Starman’ playing over the tinny PA system, and hurried away from the knots of people gathering behind him, down the gravelled drive to the iron gates. ‘It always made her feel happy, that song,’ he heard someone say between sniffles. Earlier in the brief service, a friend had read a Christina Rossetti poem: ‘When I am dead, my dearest, / Sing no sad songs for me’. ‘Starman’ was certainly no sad song, but it still had people in tears. And even David Bowie was dead now. Banks moved on quickly. He didn’t want to hang around and make small talk about death and loss with people he didn’t know. He had seen the mourners crying on the front row: two young couples, probably daughters or daughters-in-law, with small children, grandchildren, most likely; he had spotted her parents, father in a wheelchair, his head nodding and arm twitching. The others would be friends, work colleagues, nephews and nieces. The eulogy had mentioned the deceased’s tireless work for Médicins Sans Frontières so some of the guests would be from that organisation. But for Banks, this was his death, not something he wanted to share. He wanted to hold it to himself, to take it into him, if he could, let the grief become a part of him, and join with the grief of long ago. The taxi he had ordered was waiting across the road. He slid into the back seat and told the driver to head for the train station. It wasn’t a long journey, and it passed in silence. When he checked his watch against the timetable just inside the station entrance, he saw that he had almost an hour until the next train. He walked back to the street and scoped out the area. There was a Waitrose supermarket with a café to his left, but that wasn’t much use. He didn’t feel like a coffee or a cup of tea. Far more tempting was the Great Northern Hotel, almost directly opposite. It was a three-storey brick building with the ground-floor facade covered in white stucco, a blackboard listing the daily specials stood by the door. Banks crossed the street, walked in towards the reception desk and saw the bar to his left. He didn’t normally drink so soon after eleven in a morning, but after the funeral he felt in need of something to take the edge off. It sounded as if some sort of function was going on to his right. Banks could hear someone making a speech, punctuated now and then by hearty laughter. The bar was almost empty. One elderly couple sat at a table sipping white wine and that was it, apart from the pretty brunette barmaid. There was a rugby game on the large screen TV at the far end of the room. Banks sat on a bar stool, from which he would be able to watch the game as he enjoyed his drink. He was about to order a pint but decided that he’d have wine instead. Less liquid. He had a two-hour train journey ahead of him, and the toilets on trains were generally a health hazard, littered with soggy paper and awash with spillage. Usually the taps didn’t work, either, which didn’t matter much as the paper towels were scattered all over the floor. Представляем Вашему вниманию похожие книги на «Sleeping in the Ground» списком для выбора. Мы отобрали схожую по названию и смыслу литературу в надежде предоставить читателям больше вариантов отыскать новые, интересные, ещё не прочитанные произведения. Обсуждение, отзывы о книге «Sleeping in the Ground» и просто собственные мнения читателей. Оставьте ваши комментарии, напишите, что Вы думаете о произведении, его смысле или главных героях. Укажите что конкретно понравилось, а что нет, и почему Вы так считаете.